His father’s over expectations only ruined his self-confidence further with each failure. A ray of hope walked into his life as his wife, a charismatic personality spreading joy wherever she went. Everything is going per plan, but darkness comes knocking soon. He finds out that she does not have much time to love and takes it upon himself to fight all odds – even his family. If need be – to help her fight her medical condition. His father sees his own redemption in helping them, he knows his son will be a winner only if he will fight for her, with her. Will a defeated son prove himself to be a good husband? Will the father-son duo together be able to change the course of fate? 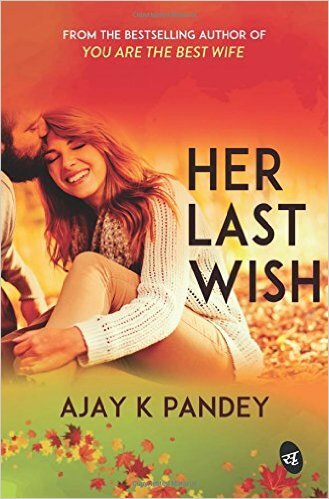 Her last wish is an inspiring story of love, relationships and sacrifice, which proves once again how a good wife makes the best husband. 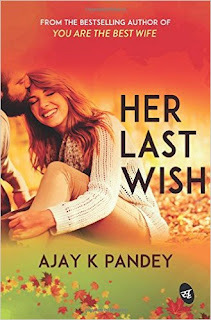 The second book of Ajay sir is pretty ok and after the huge success of the first one it was hard to stay away from the second one. From the cover and the blurb it seems a really engrossing and touchy subject but was it the same, well, read to find out. There are no doubt some flaws in the book but nothing is perfect. There was a balance of everything, in short a recipe to win the heart of readers who are into light reading. Was there any scope? It depends according to the taste of the reader. Starting from the start, well the book was full of emotions, messy relationships and a never ending struggle. From the very start i was hoping to find a bit more after every chapter but sadly every chapter has a very bland incidents which didn't seem to change till the very end. When one is reading a touchy and emotional story (here i am referring myself), there are a lot of expectations. I want to cry when the leads are crying but i was reading it like a machine without feeling extra hue of tingle in my heart even at very sensitive matters. Am I a machine then, well no, the problem in the book was the extra plain and simple projection of emotions. Who wants to read a simple book when the subject is really strong? Not me at least. There were some positive things in the book too which kept me going. Like the character Astha. i kept on liking her after every chapter. And when the truth unfolds i was falling for her with every word. She was the real hero of the book. Also when talking about supporting characters Vijay's father played a very crucial and important role. For a person like he was, dominating, seeing him in that phase was really refreshing. But there was a strong need of more characters. This story had a lot of scope and by adding more characters i think it could have been uplifted. Like there was no role of Astha's parents in the whole book. I don't understand why author didn't include them even in one chapter. I didn't like Vijay much. Why? Well I have many reasons and the most important one is that I don't like drastic changes in the characters no matter what. They ought to grow gradually and not so suddenly. It makes me feel disconnected to them and same happened here. One more problem was the first person narration. It sounded really monotonous after some chapters. I needed more insight over the details. But author filled this space a little bit by adding different versions of other people and their take over the whole scenario. Talking about the writing, everything was good. Well that was it, everything was good, not nice, not even very good. The lines seemed same, the emotions seemed same, even the choice of words was very simple and no such phase came in the book which could have hit the correct vein. The book was a nice read, it is a great book for those who need small books but this cant be read again and again. That means it is just a one time read. I enjoyed the book but there were a lot of things that i was expecting from the book which it was not able to deliver. I think romance novels are nowadays more hard to right because after one point of time they all move in just one direction and it is hard to differentiate two books which showcase the same subject matter. "If a miracle has to happen, it will happen anyway. Give it your maximum." "Winners always forgive whereas losers always retaliate." "If a child lacks confidence, it means you have never allowed him to take any decisions." You can pick this book if you are new in reading. You can surely like it because it is a nice and easy tale to grasp. But if you are looking for a composed tale then this is not the one for you. Ajay K Pandey is currently working with Cognizant, Pune. Although he grew up with a dream of becoming a teacher, destiny landed him in the IT field. Travelling, trekking and reading novels are his hobbies. Travelling to different places has taught him about different cultures and people and makes him wonder how despite all the differences, there is a bond that unites them. His debut novel You are the best wife was based on his life events and went on to become a bestseller soon after its release.